Cycle & Taste: Cinque Terre cycling tour to discover amazing landscape and sceneries of the Cinque Terre National Park and its genuine wine. 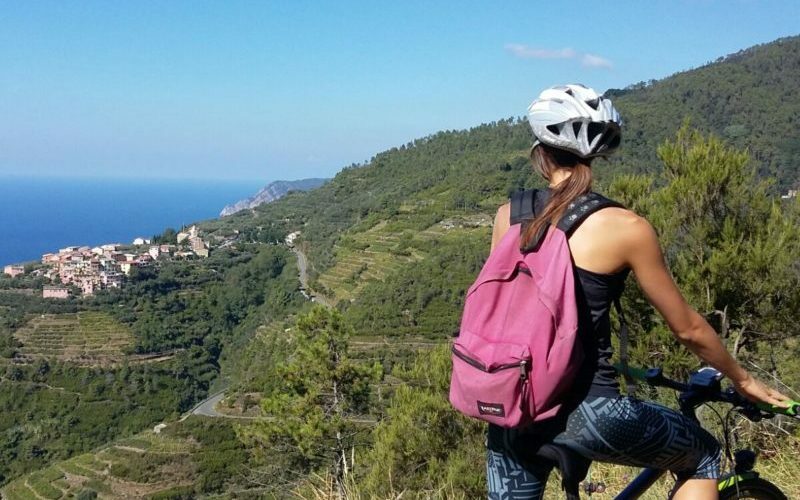 Discover the Cinque Terre National Park from an unusual perspective, cycling by e-bike along its terraced vineyards, exploring farmers and fishermen’s villages, enjoying breathtaking views over the sea. Our Cinque Terre cycling tour starts at the La Spezia town centre. We will cycle uphill as far as the Telegraph hill, cycling across chestnut woods with views over the Gulf of the Poets. From here we start a gravelled path with stunning sceneries over the sea and the terraced vineyards up to Volastra, from where we descend to the second village of Manarola. Stop for a wine tasting aperitif. Free time for lunch and to explore the village before cycling back to La Spezia along the panoramic road connecting the five villages. Price (min 6 max 15 people): 50 euro adults. Price includes English speaking tour guide, e-bike rental with helmet, insurance. Wine tasting aperitif 10 euro per person to be paid on site. This itinerary can be also booked on request on a private basis. For more info contact us. E-bikes are just as normal city or mountain bikes with a motor assistance helping you when pedalling. The more you pedal the more the electric motor will help you, making it possible for anybody, also those who are not particularly fit, to enjoy a cycling tour up and downhill.